"Yukarism" Chapter 6 -- It's Better than we Predicted!! 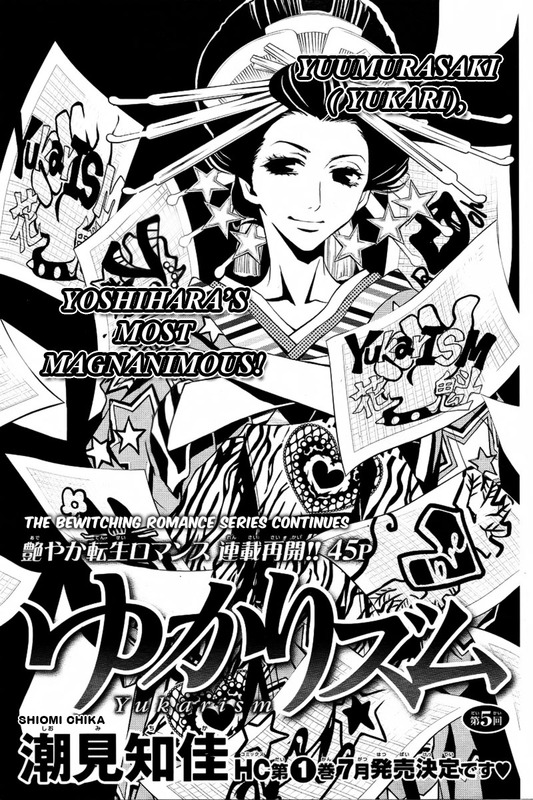 Update: Thanks to some dumb bunny who uploaded this to Mangareader, "Yukarism" from now on will have ugly watermarks. Thank you so much dumb bunny for taking a crap in all of our ice cream. Do not upload this to any manga aggregators or content farms. 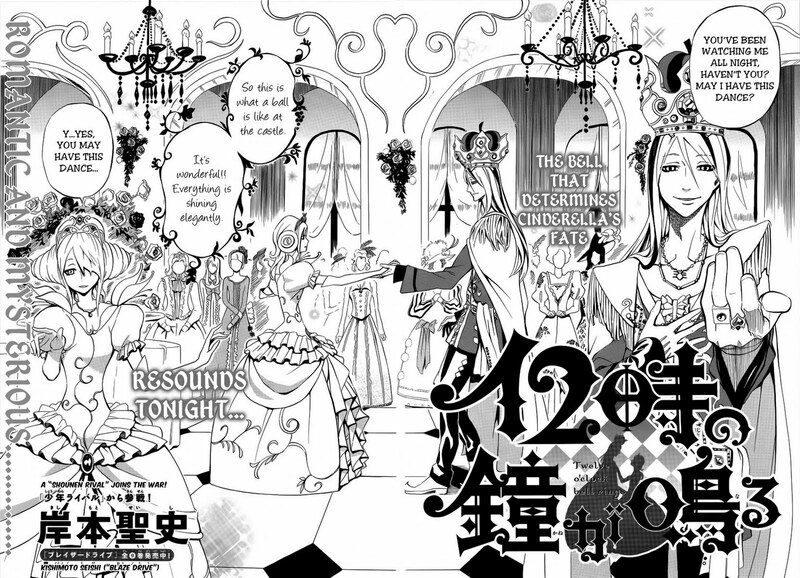 If I see this chapter uploaded, then all chapters after this will be covered in with annoying watermarks. If you are a representative of a manga aggregator or content farm, then do us all a favor and just post a link to this posting in your index for this series instead of uploading the content. This chapter of "Yukarism" has restored my faith in manga. I was so afraid that Shiomi-sensei would chicken out, but this is the real deal. This chapter is intense and intensely enjoyable. If you haven't begun to read this series yet, I highly recommend it. It has become my second favorite series behind Magnolia. Update: We are transferring "Duet with a Demon" to Weekend Betsuender. They are a new scanlation group. Please cheer them on :). I will announce what we will be working on instead in a couple of days. I skipped this post for May because by the time I remembered I wanted to it, it was already the middle of May. Hee! Anyhow...first some announcements! Our recruitment effort went well. We got some new QC and proofreader volunteers. Please welcome Chibi Anime Freak and Anime Lover! Our cleaners leveled up significantly and now are doing tougher redraws. Congratulations and thanks for putting in the extra effort to increase your skills Silver Lunar, Suzume, and Hahn! You guys rock! I also want to say thanks to all the readers out there who contributed thoughtful comments to the discussions we had. Your participation make this community vibrant and fun *bows*. I hope we can continue forward in this spirit! I just receives some very discouraging comments from some bitter and petty cowards too scared to comment under their own identity. As a result, I will be turning off anonymous commenting for a few days to keep the trolls at bay. That said, fans really need to learn how to curb their enthusiasm and remember this is fun and that we all love manga. The idea is to get as much manga out as possible. I'm not competing with anyone or any other group and I do my best to show respect to other groups. So please keep your comments constructive and respectful and assume good intent when a duplication does happen. Communication is poor between translation groups, so duplication is bound to happen. Don't just assume that one group or another is stealing projects...ugh...and besides, I'm not opposed to duplication. I like having multiple perspectives on a translation so duplication doesn't offend me. But I understand that most groups don't share the same feeling and, honestly, it makes me sad. This is why I try to avoid duplication as much as possible. In other words, I do my best to avoid duplication out of respect for other groups who may not share my views on duplication. Moving on...please, OS fans, always be respectful and considerate and understand even if there are duplications, both groups put in some very hard work on the project. Cheer both groups on rather than tearing down one group or another. And on that note: unless I know another groups future plans so I can avoid them, I'm gonna do what I see fit for this group and plow ahead despite duplication, unless there's a good reason not to. Our release schedule and our future projects are clearly listed and that's all I can do. I'm not a mind reader, so unless other groups list what they are working on, I can't know. Also, haters, be damned. Clearly you don't get it. Your comments will not be read beyond the first 5 words and they will be instantly trashed and forgotten. Ah, May...that month went by quicker than expected. We got a lot work done and faced a bit of discouragement, but that's life! You have to taste a little bit of sour to enjoy and appreciate the sweet things in life! Here are some statistics for the month of May! We had our millionth visit in May! That sounds so incredibly nutz to me, but yippee! It happened late night on the 30th. It was also the 4th year anniversary for this blog! One-Shot: "Twelve o'Clock Bell Rings"
We had originally planned to release this one-shot a little over the week ago, but there was a duplication with Turtle Paradise so I cancelled it even though it was almost ready. But we talked it over within the group and received some encouragement from Turtle Paradise and, as a result, I decided to go ahead and finish it and release it. Suzume, Ichigo Stars, and I spent too much time cleaning and redrawing the images to let the work go to waste. 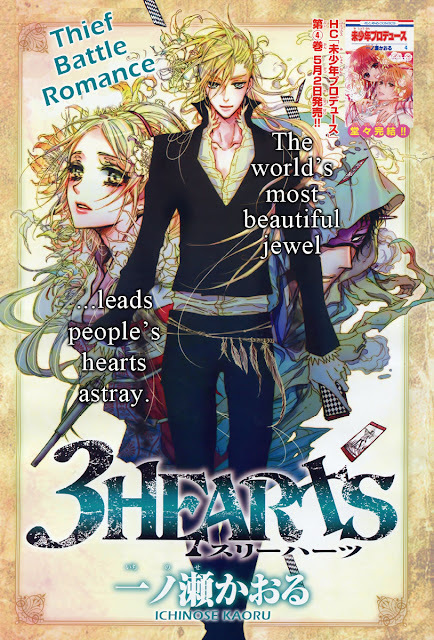 This one-shot is more about the artist style than the story for me, although the end is pretty funny, even though it's gruesome. The English adaptation is somewhat different than Turtle Paradise's so our version may have somewhat of a different feel. This version is benign in comparison in my humble opinion. I. personally, enjoyed the "bite" of the Turtle Paradise version. Regardless, it's always interesting to see how different people choose to adapt the same work. There are many ways to say the same thing :). And now onto the links! First of all I'd like to thank all the people who purchased new and used manga through me last month. Thanks to you I was able to fund the purchase of all of last month's magazine and books and purchase some goodies that will help our cleaners and redraw artists put out even higher quality releases quicker :). I'm prepping my beginning of the month orders from Amazon Japan and Yes Asia this week. If you want to save on the shipping, I taking requests to can piggyback on my order. Information about pricing and shipping costs are here. To put in a request, please send me some e-mail via the "contact" link at the top of this blog. I'm also accepting requests to purchase used English and Japanese manga from Book Off. The same pricing applies. Used Japanese manga runs $2 - 4 per volume (including the $1 to Omari's Sister). Here's a list of the June Japanese manga releases that folks who follow this blog may be interested in. I encourage you to purchase at least one volume in a series to directly support your favorite manga artists regardless of whether you can read Japanese. Our friends at Turtle Paradise have just announced it and, now, so can we! 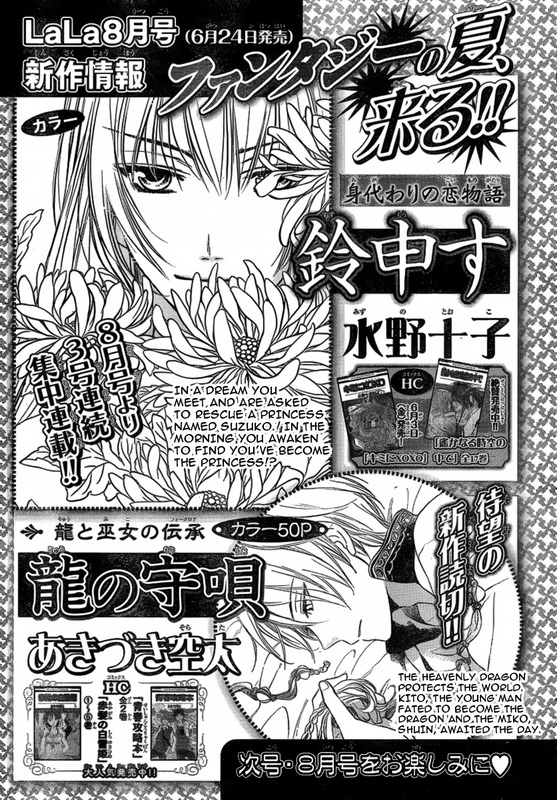 Turtle Paradise will be continuing "Junketsu + Kareshi" from chapter 10 onward. Please head over their website for more details and leave them some messages of encouragement :). 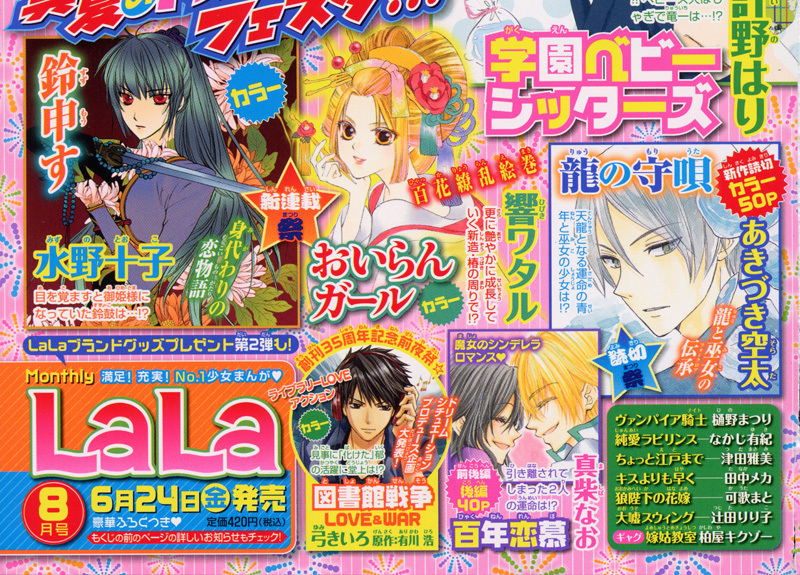 Akizuki Sorata's next one-shot has been announced. It's called "Ryuu no Moriuta". Secondly, "Suzu Mousu", a 3 part short series from Mizuno Tooko, has been announced. Both will appear in Lala 8. The previews looks really good, so for now we will put them into the schedule :). 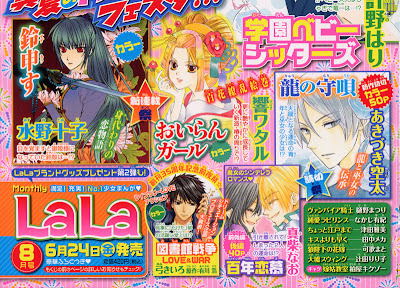 We will make the final decision on whether we'll do it once I have the one-shot in hand ;p.
It looks like Ogura Akane's next project will be the one-shot "Blue Rhapsodia" which will appear in June's Lala DX. We will be taking on this project with great enthusiasm! UPDATE: WHEN THE NEW GROUP IS READY TO ANNOUNCE THEY'VE TAKEN OVER J＋K, WE'LL ANNOUNCE IT HERE TOO. We are dropping "Junketsu + Kareshi". I'm basically the only person in the group working on that series and I've grown tired of the random and amateurish plot despite the pretty pictures. The beginning of my hatred of this series started at the beginning of chapter 7 when Kana asked "Why don't we form a club!?" What the ***!? I feel like this series was a bait and switch scam. It started out gritty and dark and Aki was a true biting vampire and then it turned into some light high school romp. I can't take this. It's an atrocity to do this to a vampire and a werewolf as cool and gorgeous as Aki and Jin. Anyhow...I've approached another group to take over the series and when they are ready to announce they are taking over the series, we'll announce the new home too. I'm very sorry to all the fans out there who love this series, but this is for the best -- at least for my sanity. If we can get the last content farm to remove our projects, I'll release a clean zip :). Well...that was ruined by a nasty commenter whose comment I chose not to publish. Apparently, some content farmers don't get it. The irritating watermarking will continue. I'm tired of entitled people who think they deserve anything free or can exploit somebody's elses hobby for profit. I mind it. I don't understand why they simply can't link to our posts or to our home page like Baka-Updates and One Manga. The only reason to upload individual pages is to farm the content to ad revenue. That Naoji!! Well, we hope you get to enjoy lots of delicious food. Image from Pika Ichi chapter 8. Update: One content farm uploaded the chapter ugly watermarks and all. Therefore, chapter 10 will be similarly watermarked. Go give thanks to them. I have sent this website an e-mail. Hopefully, they will take down our projects so we can end this stupidity before we get to chapter 10. Here is "Junketsu + Kareshi" chapter 9 and as I warned, I've watermarked some of the pages in the zip file because some bad actors continued to upload this series to manga aggregation websites and content farms. I feel bad doing this because the artwork in the series is gorgeous. I beg you to please keep your hate comments to yourself because I will not publish them. I know this is upsetting and hating me isn't going to help the situation. The water marking will stop when the uploading stops. Fortunately, it looks like some of the worst offending websites have pulled our projects. So hopefully, this is enough of a warning so that folks understand that I'm serious. Also understand, if the uploading doesn't stop I can make this increasingly draconian. I only want to do this once or twice, so please respect our rules and don't upload our projects to manga aggregations websites or content farms. Wow! The little book selling venture I decided to try on a whim went extremely well last week! I made enough money to nearly pay for all the magazines I pull materials from for our projects! Let's see if we can keep up the momentum and expand things a little. 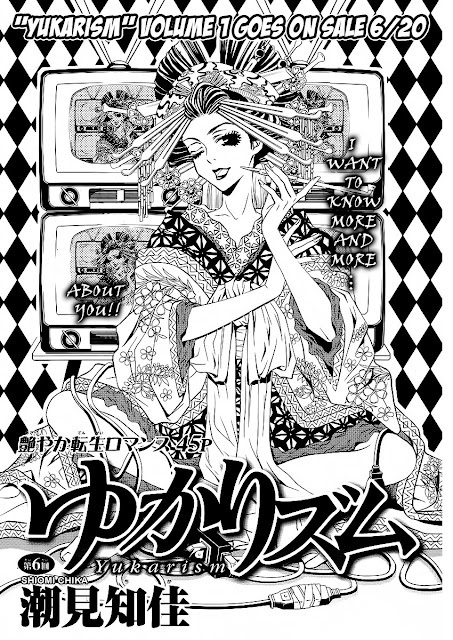 I would love it if our little community sustained this blog while at the same time did something to get money into our favorite mangakas' hands through book sales. It seems that the biggest barriers keeping most of you from ordering from Amazon JP is the language barrier and that pesky initial shipping charge. Well, I can help with that. You can piggy back on my orders to get cheaper shipping from Amazon Japan. 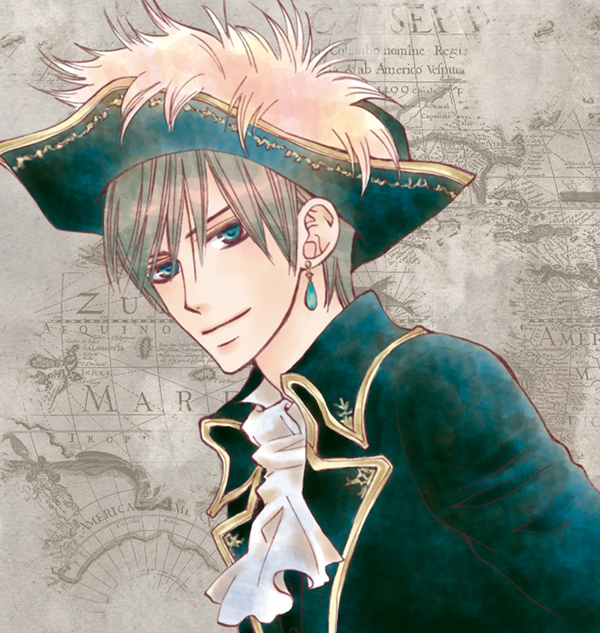 I love stories with handsome rogues, mysterious women, moonlit nights, and stolen treasure. Ah, yes, the romance of it all is the best and, in my humble opinion, this one-shot delivers. Sigh...I would love this one-shot to be translated into a live action or animated movie. It would be so beautiful! Don't have many deep thoughts about this one-shots. It's just a confections to enjoy. 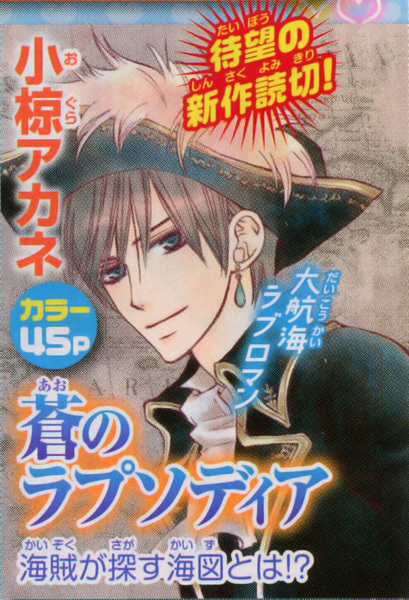 I do wonder whether calling the main character "Jin Tonic" is a little bit of call back to "King of Bandits Jing". In that series all the "Jing Girls" were named after mixed drinks. I love that series and the follow on series "Twilight Tales". Those series are out of print in English, but it you ever do find a complete set, I highly recommend reading the series. Kisu by Matsumoto Tomo, Volume 7 and 8 -- Sold! 龍の花わずらい ("Two Flowers for the Dragon") by Kusakawa Nari, Volumes 1 - 4 -- Sold! All of the books are in "like new" condition and $4 each. All payment will be handled through Paypal. Shipping will be by Priority Mail Flat rate shipping or First Class Mail or Media Mail. I can handle International shipping to most countries. If you are interested in purchasing some of these books, please contact me via the "contact" link on the menu on the top of this blog. In the e-mail tell me what you want to purchase, what method you want the items shipped, and what e-mail address I should send the invoice to. Going to Book Off -- Taking Purchase Requests for May 18th! Magazines: It's best to purchase 2 or 3 to take advantage of the flat rate priority shipper. The minimum shipping on a magazine will be $10.95 because they are so thick. That being the case, you may as well spread that $10.95 across 2 or 3 magazines or perhaps buy some books. There are other shipping methods that balance time and cost. Just tell me what you want and I can accommodate you. All transactions will be handled through Paypal. Yep! We do have two releases today! I hope you all will take the time to read both "Yukarism" and "The Ghost Apartment Manager". "The Ghost Apartment Manager" isn't typical shoujo, but I hope if you've never read the series you will give it try, because it is a series with lots of heart and humor. Here's a link to the first chapter. At last! Here's Yukarism chapter 5! First off I would like to thank Ichigo Stars for some amazing redrawing gymnastics on the title page. My socks have been completely knocked off by her skill. 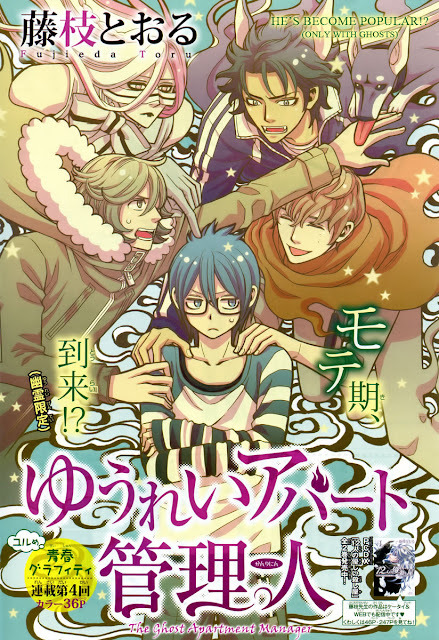 I would also like to thank Suzume for her amazing redrawing skills as well. Suzume has been working really hard to develop her Photoshop skills and I must say that she totally shredded the learning curve by getting this good so quickly. Oh! And we've got some new people helping out with the Proofreading and QC! Please welcome Chibi Anime Freak and Anime Lover. Ai Ore! Volume 1 (Just Added!) -- Sold! Mixed Vegetables Volumes 4 - 8 -- Sold! Tail of the Moon Volumes 1 - 15 --Sold! The Lizard Prince Volume 1 -- Sold! I've done my best to price them decently and if you buy 3 or more, I can give you a discount on the shipping. Just send me an e-mail to let me know about purchase so I know your a regular reader of this blog. Overall readership was down ~5% in April. I guess some of you really like your monthly dose of "J+K". Haha! Don't worry, "J+K" will resume soon enough. Magnolia Chapter 10 -- Beefcake! Beefcake! 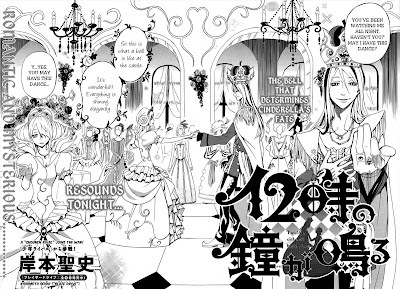 I suspect after this chapter, Sui is going to gain some new fans. I didn't expect to see a different side of Sui, so this chapter was a happy surprise and I heap praise upon Naked Ape for developing Sui this way. Oh! And thanks to Ichigo Stars for help with the title page! This was supposed to come out a little over a week ago, but sometimes life takes unexpected and sad turns, and people have to stop everything to observe the passing of a life. It's difficult to take the passing of someone your own age. I didn't know the deceased well, but her death did cause me to pause and assess my own mortality. All I have to say is life is fragile, so make everyday your best :). 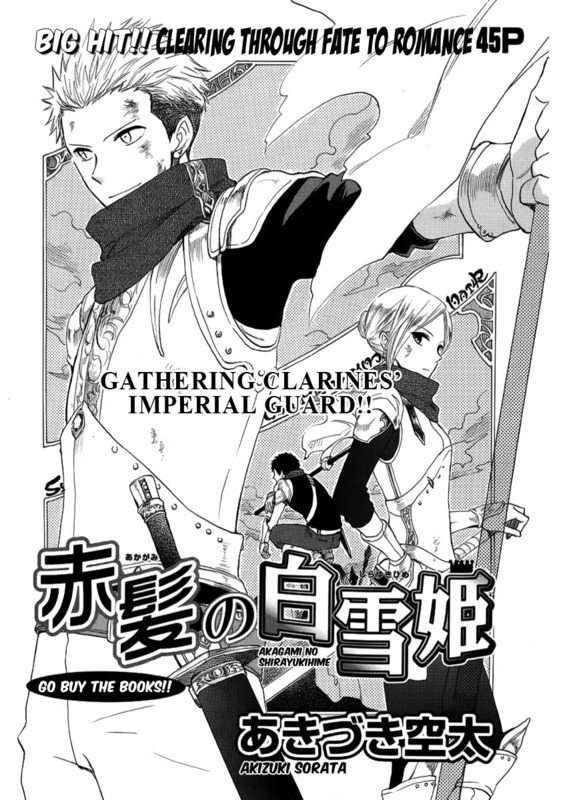 Anyhow...here's Akagami no Shirayukihime chapter 24. This chapter taunted and teased me the whole time. It really fought against get done. Hahaha! But it's done and I can get on with translating "Magnolia" now. Typesetter (you need to know some Japanese) -- this is one a month or less. If you are interested, please send me (Kuroneko003) an e-mail via the contact link at the top of the blog (all other communication will be ignored). Redraw and clone stamping people have some samples ready and be prepared to be tested. Please only apply if you really have at least 4-hours a week to volunteer. If you are interested in becoming a volunteer at Omari's Sister but have no experience, you can still contact me to. As long as you have time, enthusiasm, Photoshop, and basic Photoshop skills, I can get you up and cleaning within a week. Just be aware that at this time I may not be able to start training you immediately. Also, if you want to help with translation, contact me. 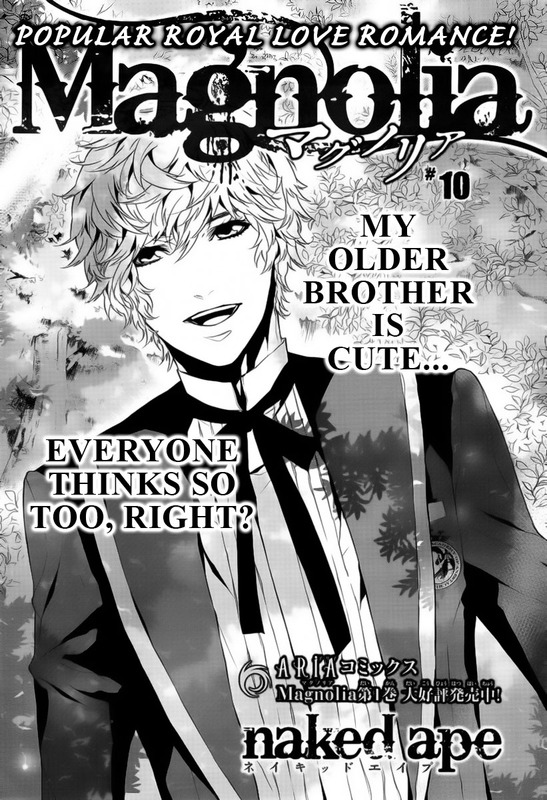 I have "Pika Ichi" chapter 10 and based on the content, we will resume the series! Chapter 8 has been sent to the cleaners. May is already set, so the resumption of series will happen sometime after May. I will have to look at the schedule and reassess the priority of releases. This is really hard, because there are a lot of one-shots I'm very in love with. We'll figure it out though.